Archives of Eaton Bray News for March 2008. An overhaul of youth football across the county has prompted a heated debate among fans. A mixture of disgruntled parents and supportive coaches swamped Bedfordshire's Football Association (FA) with calls following a decision to ban competitive soccer for youngsters. The county's football bosses have enforced English FA regulations banning knockout cup matches, league tables and the awarding of points in under-eights matches. The regulations were not new, but until now had not been enforced. They affect competitions across the country. All of Bedfordshire's under-eights football teams will still follow a fixture list and play matches, but will not get points for winning, ending the competitive element of the Chiltern Junior Sevens League and Filmergraphics League. Peter Brown, Bedfordshire FA's chief executive, said: "We have had a lot of reaction, but we are only the messengers not the decision makers and this is a policy across the country, not just in Bedfordshire." Visitors to our websites were mainly against the FA's decision, and 76 per cent of people who took part in our internet poll said the spirit of competition is one of the key lessons in life. Drew Stanley, of Luton, said: "Has anyone thought to ask the kids what they want? My bet is that 99 per cent of them will want the competitiveness of leagues. Kids love being competitive." However the FA have also gained some support from football fans. Bob Smith said: "I think it is a good idea. We spend too much time just trying to win and not enough time playing the beautiful game. "Maybe this will stop parents bellowing from the touchline - a public embarrassment." Children and staff from Eaton Bray Lower School enjoyed a journey back in time when they dressed up as characters from different eras for a history day. 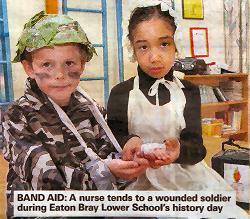 There were some colourful costumes on show, which included several wartime evacuees, wounded soldiers and pirates. The history day has been linked into the children's learning programme. 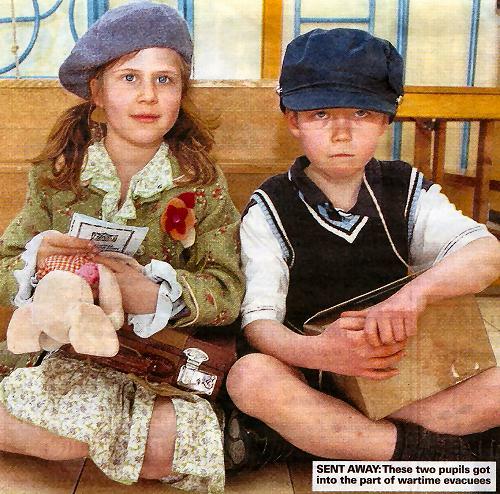 Each pupil dressed as a character from the period in history which they are studying. The school's head, Sue Hounslow, who dressed as a pirate for the day, said: "It was a big success. The children thoroughly enjoyed it and it helped them learn about history. "Each. child does research from home and they gain a lot from it." Had a good chuckle at a rhyme from an Eaton Bray poet the other day. The poem, by Norman Davies, is all about the village, and appeared in the March edition of Focus magazine. It's called Our Village, and I thought I'd share an excerpt or two with you. They were used in the dye for the hats made of straw in the looms!" There are lots of nostalgic observations about the village in days gone by. that's more than a computer can master! and may that always be true." Home in the Leighton area appeared to have escaped the worst of the weekend flooding, according to Leighton fire brigade. The only call to Beds Fire and Rescue was from a woman in Station Road, Stanbridge, who reporting some flooding on Sunday morning. An officer attended the scene but no action was needed. Elsewhere drivers in Eaton Bray High Street, negotiated deep standing water when drains were unable to cope with overnight rain. In Bucks an officer was sent twice to Manor Farm Lane, Ledburn, and three times to Leighton Road, Northall, during the Sunday, to give help and advice on how to cope with flooding. Were you flooded out at the weekend? Add your flooding stories by Commenting on this article. Play swung back and forth as Matt Kennel) and Toby McGee drove the ball forwards for Blues and created some superb strikes, but it was Whites who landed first to go ahead within ten minutes. Connor Tough replied with a stunning shot to level the match and defenders Sam Bramston and Daniel Challis effectively closed down any further attacks before the break. Blues settled into their rhythm in the second half, hogging possession throughout. Keeper 011ie Mulcahy traded with Daniel to get some on-pitch time, putting in some adept defensive work and working forwards to place an impressive shot that fell just short. Jack Reynolds, Luke Jearrad and Robert Bunting slotted some neat passes in between the Whites defence to open up more opportunities, and Bradley Hicks dispossessed the occasional attacker to ensure the opposing goal tally remained at one. Ultimately MoM Connor scored again as did David Wood to compound a clear. victory. It seemed as if it was going to be a repeat of last week where Lions totally controlled the game with all the pressure coming from the Lions, but the ball would just not go in. The bar, posts and a well positioned goalkeeper simply kept the Lions out. But with only 2 minutes to go of the first half Charlie Giblin put Lions ahead and they went in 1-0 up at half time. Lions started the second half strongly with a goal from Dax Roe and two from Karl Shrowder in the first nine minutes. With strong performances from George and Jack in midfield and Freddy, Lee and Harrison working well together there wasn't much for Lions' goalkeeper Toby to do. In a match that they dominated from start to finish this was a good result for the Lions. Lions notched up their first win of 2008 as they finally overpowered a game Oakley side in an enthralling encounter which the first of a brace of decisive goals. Defenders Ben and James ran down every attack and countered with their usual scything clearances, while MoM Aarin took on all comers and made noteworthy inroads deep into Oakley territory. The second half kicked off at the same frenetic pace and had onlookers gasping as shots winged the nets at each end. Mason and Charlie put together some accomplished passing moves that threatened the Oakley back line, while Adam and Chris worked hard to chase down every ball. Finally, it was Sean's laser-guided corner into Dominic that resulted in the winning goal, although a seemingly never-ending half saw keeper Dan well tested forcing him into some truly textbook save-making. Another great match and a super win, this one away from home, giving the Lions a run of four consecutive wins. Lions started strongly with a goal after six minutes from Hattie and continued to control the match right up to half time and were unlucky not to have scored again. Lions used Shannon as reserve keeper after Nancy had to come off but the team pulled together and kept a clean sheet. Six minutes into the second half Megan scored Lions' second. Again Lions' midfield of Darcy, Emily and Elsa were strong and in total control despite some unexpected decisions going against them. In defence Katie was in control with good support from Devon and Beth. The recent results are well deserved for a team that has worked hard and pulled together and never given up. It is a real achievement for their first season together. 100% grant funded loft and cavity wall insulation is now available to all residents aged 70 years and above. This offer, which became available earlier this year, is made irrespective of your income and savings and whether or not you are in receipt of benefits. In fact, the only requirement is proof of age and name and address. For most households, insulating has never made better financial sense. Following autumn's record oil prices and surging wholesale gas and electricity prices, insulation could be our last best defence against rising energy bills in 2008. All homeowners and private tenants qualify for discounted loft and cavity wall insulation. Fully insulating your home could easily reduce your fuel bills by £100 a year. The payback time is typically short and the long term financial and environmental benefits are high. For more information, contact the Energy Efficiency Advice Centre on 0800 512012. Painting colourful pots at birthday parties or making bowls with a group of brownies is all in a day's work fora mum from Edlesborough. Last March Jane Blumsom, 44, set up mobile ceramic business Crockadoodledoo and now the mum-of-three is enjoying success with her creative idea. She discovered her love of painting pots after regularly taking her daughter Molly to a ceramic cafe in Leighton Buzzard called the Crazy Craft Cafe. Because Jane found it so relaxing, as soon as she saw the business come up for sale, she tried to buy it. She ended up opting out of the sale for various reasons and then came up with the idea of going it alone with a mobile business. With her plan firmly in place she went along to ceramic specialist Sue Lacey in Bicester to train and prepare her for her new enterprise. Since then, Jane has been doing on average two parties a week, which can be anything from taking her ceramics to a day centre full of pensioners or helping a group of brownies paint pots for Mother's Day. She is often hired for girly nights when the women paint items such as serving dishes or jugs while enjoying a glass of wine and a good gossip. Ceramic parties are also popular for personalising wedding or christening gifts and during December, people paint their own Christmas baubles. But birthday parties for both adults and children seem to be the most popular choice for a Crockadoodledoo bash. Jane, who lives at The Green in Edlesborough and used to work in the finance department at Bedfordshire Adult and Community Learning in Leighton Buzzard, said: "You don't need to be artistic to do this sort of thing - you can get great results without being able to draw." She said that when she got a group of adults together they were quite fearful of picking up the paintbrushes. So to help them along and to give them ideas, Jane takes loads of samples with her. 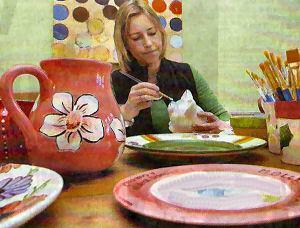 She said: "It's just incredible - I start the party with all these blank ceramics and they end up being painted with everything from flowers and petals to stripes and dots." Jane said children are really confident when painting and have no inhibitions and know exactly what they want to do. A really popular item for children to pick are the hundreds of different ceramic money boxes which come in all shapes and sizes, including animals, telephones, pigs and cars. Before each party, Jane gives the host one of her catalogues and they take them away and ask each of their guests what they would like to paint on the day. Then Jane goes along to her supplier and orders each piece. "It's very personalised," she said. The painting takes place at the party, which lasts around two hours, then Jane takes them away with her, glazes and fires them and returns them a week later. Among her happy customers are children from Eaton Bray Lower School, who designed and painted plates for teachers and assistants at the end of the last school year. After each birthday party, Jane gives the host a free plate so that all their party guests can sign it, which makes it a perfect memento to remember the day. In the future Jane would like to see Crockadoodledoo franchised but for now she's happy inspiring people at local parties and just doodling along. Wee Willie Winkle ran through the town, upstairs and downstairs in his nightgown, and youngsters at Eaton Bray Lower School went to lessons in their pyjamas for World Book Day. The school chose bedtime stories as their theme for the day and they all had great fun talking about their favourite book and why they enjoyed it so much. 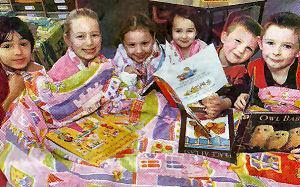 They also wrote bedtime poems which headteacher Sue Hounslow said will be published as an anthology. The next Parish Council meeting to be held at the Coffee Tavern on Monday 7th April 2008 at 7.30pm. Items for the April agenda to be requested no later than Thursday 27 March 2008. SPARX Theatre Company is for people with Special Needs and is open to all ages and disabilities. It also actively encourages integration and welcomes anyone who wishes to participate. Run in partnership with Leighton Buzzard Theatre to serve the local community, Sparx is administered by a Board of Trustees and managed by our project leader, Chris Amos a local professional theatre practitioner. The Company holds Creative Drama Workshops on Saturday mornings between 10.30 and 12.15 in the Theatre lounge. These workshops are run on a regular basis throughout the year (normally to coincide with school terms) culminating in a production performed at the Theatre. Just come along to one of our workshops where you will be made very welcome, or if you would like more details about us, please phone Ray on 01525 874335. Worshippers from the North Chilterns Group of Parishes, comprising the churches of Totternhoe, Stanbridge, Tilsworth, Kensworth, Studham, Whipsnade, Eaton Bray with Edlesborough and Dagnall, are trying something completely different for this Lenten season (the period leading up to Easter Sunday). The exciting course for 2008 is comprised of a series of Medieval Mystery Plays, with a different play being explored each week. Chaucer's English has been updated to make things easier to follow. The plays mostly originated in York in 1376, at a time when few people could read or write and when religious matters had an influence on every aspect of everyday life. The pageants told the Bible story from creation through to the coming of doomsday and were presented on pageant-wagon stages, which were drawn through the streets of York, Chester and other northern towns from one 'playing station' to another. They would start with the creation story at dawn and finish at dusk. Sometimes the wealthy would pay to have plays performed in their own homes. The plays were originally presented by the different guilds of craftsmen. They were originally liturgical pieces known as 'mysteries', which is why the plays are called mystery plays. Over the years the plays changed, especially during the turbulent times of the Tudors, and by the late 16th century they had ceased altogether. But they were rediscovered and performed again after the Festival of Britain in the mid-20th century. There will be a reading of extracts from all of the plays at St Giles Hall, Totternhoe, next Tuesday (March 18) at 7.45pm and everybody is welcome. A traveller site at Eaton Bray is set to get a £73,013 makeover. Beds County Council has been given the money to spend on Chiltern View in Northall Road as part of an East of England Gypsy and Traveller Site grant totalling £6.9 million, announced on Friday by Communities Minister Ian Wright MP. Across England, since 2006/7 the Government has approved £54.6 million of investment (including £50,000 for Chiltern View) that will provide over 400 additional pitches for gypsies and travellers, and refurbish 120 sites. A further £97 million of funding is available between 2008-11, and bids are now being invited for 2008/9. Mr Wright said: "This funding is vital in delivering both new and better sites to ensure that gypsies and travellers have authorised, decent places to live and to help reduce the £18 million annual enforcement bill. "It is important that councils ensure there are enough authorised sites for the gypsy and traveller communities. "A good supply of legal sites can break the vicious cycle of evictions that is costly in terms of both local tensions and taxpayers' cash." The number-crunching on council tax is finally over, so South Beds householders can now check out the size of their bill for 2008/09. Dunstable households in average band D properties will pay 1,623.09 in council tax in the next financial year. That's a rise ofabout £66.75 compared to the bill for 2007/08. In Houghton Regis, the council tax bill for average band D homes will be £1,618.89, an increase of about £72. Council tax bills include share-outs of different sizes for various authorities, providing all sorts of services for people living in South Beds. The last piece of the jigsaw was put into place at the budget-setting meeting of South Beds District Council. Councillors voted through the Conservative budget, which means there will be a rise of 2.99 per cent for the district council's slice of the council tax bill. That's the lowest council tax percentage increase of all of the county's major authorities. The district council's budget requirement for 2008/09 was set at £15.6 million. Average band D householders in South Beds will pay £158.59 for district council services in the coming year. That works out at a £4.60 rise, 9p per week, compared to the current year, for those services. However, the financial strategy for the district council had been prepared on a "business as usual" basis, projected over a five-year period. He said that further improvements to the council's performance management systems were working well. And he went on: "We strive to put the customer at the heart of everything we do." Mr Penman highlighted the All-Pay system which had been brought in for payments. . He said that this was popular with most residents, with about £1 million being collected every month through the system, from 15,000 transactions. "We are providing a better and more convenient service to our customers, and saving £100,000 a year," he said. The Grove Theatre had been completed at the end of the previous financial year and had been showing an exciting programme of events. Mr Penman said: "This was a magnificent venture, which is a credit to joint working and those members and officers that were involved." He talked of a new contract for refuse collection and street cleansing, helping the council to meet recycling targets and maintain the high standard of cleanliness in South Beds. The executive councillor also spoke of the makeover project for Bedford Square, in Houghton Regis, and the scheme to demolish and replace flats in London Road, Dunstable. Car parking charges and local land charges would not be going up in the next financial year. More capital resources would be spent on empty properties, to ensure that homes and gardens were in good condition when new tenants moved in. Work on revitalising town centres was continuing. Mr Penman said that £700,000 had been earmarked to improve the area around West Street and Ashton Square, in Dunstable. That would be paid for by a government grant. He also spoke of the proposals to create a community football development centre in north Dunstable. The councillor pointed out that a three-year government grant settlement had been lower than expected. He concluded: "This is a prudent budget, which continues to improve services while keeping council tax as low as possible." The biggest chunk of the council tax bill goes on Beds County Council services. Average band D households in South Beds will pay £1,123.47 for that part of the bill. Another slice, £135.28, is earmarked for the Bedfordshire Police Authority, and £78.84 will go to Bedfordshire and Luton Combined Fire Authority. South Beds District Council will take £158.59 of the bill. On top of all that, average band D householders living in Dunstable will pay £126.91 for services provided by Dunstable Town Council. Those living in Houghton Regis will fork out £122.71 for services from Houghton Regis Town Council. Should U8s be forbidden competitive football? A decision by the English FA to ban knockout cup matches, league tables and the awarding of points in U8 matches means that the SKF Chiltern Junior Sevens League's U8 divisions have effectively been handed a death sentence. Beds FA chief executive Peter Brown says the league should not have been running tables for U8s or cup competitions this season, either. Mr Piggins helped set up the league in 2001 after 11-a-side games for U10s were banned by the FA. He has had one child play at the U8 level and believes competitive football does not do the children any harm. He said: "We've been doing U8s for six or seven seasons. It started off as an U10 league because they were who the FA stopped playing and it's gradually grown." 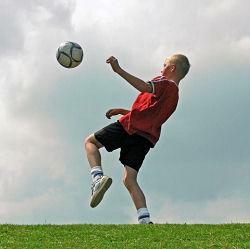 Children from as young as six have been allowed to play competitive football in recent seasons, but the enforced changes mean that children must be aged eight and over if they are to take part next season. Tell us what you think - you can leave an online comment about this story by following the instructions at the bottom of the page. A gently undulant pitch and unpredictable crosswinds kept both teams on their toes in an enthralling first half. Possession was divided evenly in a competitive opening 20 minutes, with both teams creating chances. Lions' rugged defenders Sam Bramston, Jack Reynolds and Daniel Challis bravely closed down the St Martins attacking plays, and, along with 011ie Mulcahy's commanding saves, ensured the score remained 0-0. In the second half Lions came out firing and Connor Tough managed to break through as Toby McGee drew the attention of the home defenders in front of goal. A sliver of an opening was enough for Connor to slot the ball deftly into the net. Matt Kennel) looked set to compound that lead but was denied by some effective defence work. Not ready to concede defeat, St Martins landed an equaliser five minutes later, despite expert plays from Robert Bunting, Bradley Hicks and deserving MoM Luke Jearrad, none of whom let up for a moment. Lions knew they were in for a tough match and raised their performances accordingly, but were unfortunately undone by a goal either side of half time. The defensive duties displayed by Sarah Jane, Misha (GOM) and Holly were outstanding. Megan between the sticks was forced to make some great saves. Mel & Liberty in the first half and Amber Wright and Steph in the second were all solid in midfield and gave the opposition little time to settle on the ball. Lions felt that their luck would change mid-way through the first half when they were awarded a penalty for handball, but Georgia was denied by a lucky save from Crawley Green's goalie. Amber Walsh also came close on a number of occasions in the second half. With the possession and chances that Lions had it must only be a matter of time before they turn their efforts into a much deserved win. Another great team effort and another great result with two away wins back to back. The Lions playing with the wind were putting the pressure on Potton and took th lead through Hattie after 11 minutes and i wasn't long before Darcy came close to scoring a second. After 15 minutes the Lions were unlucky to concede a goal and despite Megan, Elsa and Emily pushing forward it was 1-1 at half time. Even against the wind in the second hal Lions' defence of Katie, Beth, Devon and Shannon looked solid and Nancy in goal coped with everything that came her way. I was Lions' constant pressure and determination that caused Potton to score an own goal. With three Lions ready to pounce on any mistake the ball was alway going to end up in the Potters net. The Lions supported each other well an, earned themselves another well deserved two points. Lions needed a win to hang on to second place in the division but things started badly when they conceded a soft goal afte only five minutes and Eagles scored another soon afterwards. Coates made some promising attacking runs for Lions, feeding the ball through to Marshall, but the Eagles defence seemed impenetrable. Under pressure Lions conceded an own goal and Eagles scored fourth before half-time. Lions played better in the second half, with great defensive play by MoM Thiel, Lancefield and Broughton keeping Eagles at bay. However, Lions struggled to get past Eagles back four and could not get their shots on target when they did. Eventually Lions were worn down by the relentless pressure from Eagles, who scored twice more in the last five minutes. This was a disappointing result for Lions who obviously struggled against a disciplined and physically stronger side. You are viewing the March 2008 archive.